With the recent passing of Honeymooners star Art Carney, the media has been discussing the discovery of the classic television shows from the 1950s by a new generation of fans. To me this is the most amazing example of unquestionable quality in a television series, one that transcends time and age to continually entertain its viewers: I Love Lucy. By now everyone knows the basic plot of the series. Lucy (Ball) and Ricky (Arnez) are a happily married couple who enjoy a good bout of ridiculousness now and then. With their best friends and neighbors, Fred (Frawley) and Ethel (Vance), they get into innumerous comedic mishaps. With the chemistry of the stars as well as the nearly perfect comedic timing, I Love Lucy is a true classic. When Ricky refuses to allow Lucy to be a part of his nightclub show, she fakes having multiple personalities as a result of trauma. Knowing that she is faking, Ricky hires a fake psychiatrist to try and prove that Lucy's illness is all an act. A terrific comedic performance by Ball makes this a four heart episode. Lucy and Ethel enter a contest for dramatists with a piece titled "A Tree Grows in Havana" with Ricky in mind for the lead role. When Lucy decides to scrap her original idea and submit a period piece set in England, she forgets to tell members of the cast and on opening night, it is up in the air what play the performers are performing. A strong episode, earning four out of five. When Lucy and Ricky get into a fight with Fred and Ethel, they decide to move out of their apartment but find that they can't because of their lease. So, in desperation, the pair decide to be as loud and obnoxious as they can in an effort to get kicked out. Funny but rather contrived, three out of five. Once again Lucy tries to land a role in Ricky's show with disastrous results. When an opening comes up for a ballet dancer as well as a burlesque comic, Lucy tries out for both, with typically hilarious results. A very funny episode that is perhaps the best of this set, five out of five. Image Transfer Review: Given the age of the original source material, I was surprised to see the image transfer look as well as it does on this DVD. The print is not free of blemishes, but sharpness and detail are done nicely. This is likely the best that the episodes will ever look. Audio Transfer Review: The original mono tracks are offered here and as expected, the dialogue from the center channel is not as great as other releases, but it is serviceable. It is clear with no distortion evident. Extras Review: The disc does contain a scant bit of nice material in the form of excerpts from the original radio show, "My Favorite Husband," which later became episodes for the TV series. Each show is played in its entirety and are generally pretty funny. 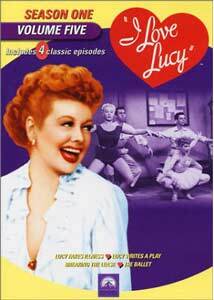 It is nearly impossible to dislike I Love Lucy, so recommending this a given. The extra features are an unexpected surprise.